November through January is a hugely sensory time of year for me. It’s a time of year when every lingering scent or passing breeze comes with some sort of memory, whether it’s that of minestrone on Halloween or the blinding snow from the Blizzard of ’96. Since I lived in Los Angeles for the 2010 and 2011 holiday seasons, I found myself constantly cursing the palm tress and sunshine and Santa Anas for the lack of snow and sweater weather. In an effort to channel my east coast roots last year, I bought a bottle of bourbon to add to hot apple cider for a dinner party in hopes that I could bring a bit of the east coast to LA. It worked — the entire house smelled deliciously of the east coast holidays. Somewhere in a parallel universe, I’m the badass girl who shocks her date by ordering top-shelf bourbon, straight, at the bar and enjoying every sweet sip while enthralled in conversation with that hunky, slightly scruffy man in a well-tailored suit. In reality, bourbon suits me as a grown-up nightcap, complementing a robust cider spiced with vanilla and cinnamon…and Molly agrees. Put apple cider, water, cinnamon sticks, vanilla bean (seeds and pod), nutmeg, and salt in a medium-size pot. Simmer over medium heat until cider becomes fragrant. Take cider off heat an top off with bourbon. Pour cider into mugs and garnish with sliced apple. 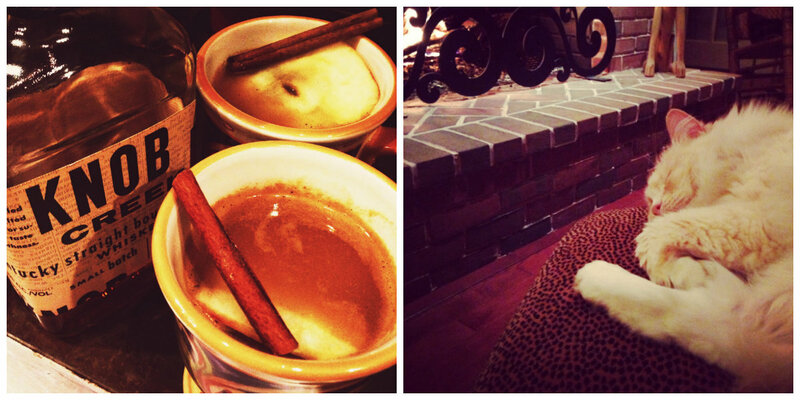 Best consumed in front of a roaring fire with a good book and a beautifully dressed man fluffy cat at your feet. Yes, please to this drink! Also, can I have the kitty…?